This interesting surname, with variant spellings Hutchins, Huchings and Hutchinges, derives from the medieval given name "Huchin", a diminutive of the Old French personal name "Hu(gh)e", introduced into Britain by the Normans after the Conquest of 1066. This is in origin a short form of any of the various Germanic compound names with the first element "hug", meaning "heart, mind, spirit". The suffix "s" denotes "son of". The surname dates back to the early 14th Century (see below), and other early recordings include: Richard Huchins in the 1237 Subsidy Rolls of Worcestershire; Edith Huchenes in the 1332 Subsidy Rolls of Staffordshire; and John Huchouns in the 1337 Court Rolls of the Borough of Colchester. Recordings from London Church Registers include: the christening of Elizabeth, daughter of Wylliam Hutchinges, on January 2nd 1585, at St. Giles' Cripplegate, and the marriage of Elizabeth Hutchings and Robert Milner on July 11th 1597, at St. Peter-le-Poer. 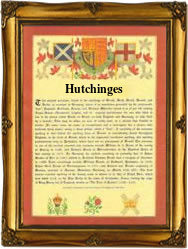 A Coat of Arms granted to a Hutchings family from Somerset depicts a gold tower embattled on a red shield, the Crest being a red lion's head erased ducally crowned gold. The first recorded spelling of the family name is shown to be that of Gilbert Huchun, which was dated 1296, in the "Subsidy Rolls of Sussex", during the reign of King Edward 1, known as "The Hammer of the Scots", 1272 - 1307. Surnames became necessary when governments introduced personal taxation. In England this was known as Poll Tax. Throughout the centuries, surnames in every country have continued to "develop" often leading to astonishing variants of the original spelling.